This past year, the Re‐Imagining NE 85th Street project team has been engaged in a major cleanup effort of NE 85th Street between 21st Ave NE and Ravenna Ave NE. This work included clean up of trash, greenway overgrowth and illegal dumping. They also began initial restoration of the wetlands on the east end of the street. With vouchers from the City of Seattle, they removed over 15 tons of brush and debris, and over 1 ton of illegal dumping. The next stage of this project is the restoration of native habitat along the planting strip on the south side of NE 85th Street. A goal of urban restoration is to support critical habitat for birds and other wildlife, but it also provides benefits to humans such as ameliorating storm water and pollutants, decreasing heat, stabilizing steep slopes, and noise reduction, in addition to creating a visually appealing and vibrant steetscape. 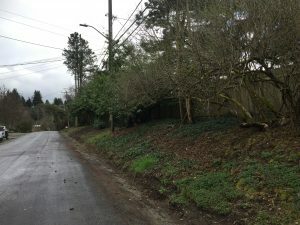 The volunteer group has now obtained the appropriate permits from the Seattle Department of Transportation (SDOT) to implement this native restoration project and will begin work this month. An urban horticulturalist has volunteered her time for the conceptual design of the restoration plan, and members of the Seattle Green Partnership have offered ongoing expert guidance. Native plants have been donated by members of the Seattle Green Partnership, as well as another local non‐profit (Mountains to Sound), and some plants have been purchased from the King County Conservation District by the neighborhood group sponsoring this project. Restoration work this spring will involve removal of invasive and noxious species (such as Himalayan blackberries and holly) and basic site preparation, followed by planting of approved trees (Cascara and vine maple), low‐growing native shrubs (such as red‐Osier dogwood, twinberry, Indian plum, Pacific ninebark) and ground covers (such as salal). The project team will have their first work party on Saturday, March 11, from 1-4 PM. Stop by if you have questions, or if you would like to volunteer! A big ‘thank you” to the RE-Imagining NE 85th Street team and all volunteers for your great work. I use NE 85th St frequently and it has never looked better. Plus, it’s now much safer for both pedestrians and vehicles now that the overgrown bushes have been removed. Great job! Hi John – Thanks for the kind words! 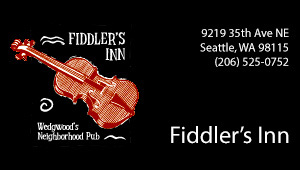 We’ll be sure to pass them along to the Re‐Imagining NE 85th Street project team. Like you, we’re so grateful for their efforts.